The peculiar condensation of that work has also given no small amount of trouble to readers who approach contemporary poetry with suspicion. As Anna Kałuża has correctly observed, “Marcin Sendecki’s books of poetry have for some time offered a provided a pretext for comments about the deepening hermeticism of Polish poetry.” We do not have space here for a discussion of hermeticism, which, first of all, has been well-documented (accusations by Jacek Podsiadło, Tadeusz Dąbrowski, and Andrzej Franaszek have been repeatedly commented upon), secondly, does not contribute much (the rebuke of hermeticism is based on a reflexive disapproval of the legacies of various avant-garde movements), and thirdly, often leads to superfluous polarization of the small poetic universe. The point is that here, we finally have the first monograph devoted to the “activities” of Sendecki’s poetry, a publication joining in a conversation already under way. The book at hand is Paweł Mackiewicz’s Sequel. O poezji Marcina Sendeckiego. If the task of a monograph is to place its protagonist on the map of literature, it should be stated straight out that Mackiewicz does so with expertise, unforced passion, and an erudition which is frequently impressive. To put it slightly differently, as a voice in matters of importance for the reception of this poet, certain answers are not given unambiguously (the question of that alleged hermeticism is not treated exhaustively – perhaps the right choice, when all is said and done). In fact, for someone in search of a guide to Sendecki’s oeuvre, certain parts of the book evoke a feeling of shortfall, eliciting a hunger for further development, saying what was left unsaid, or complicating what was not. The main quasi–category addressed by Mackiewicz is the splendid metaphor of the title: the sequel. It fits into a series of intersemiotic explicative metaphors which, using the logic of the supplement, the significative surplus, or trans-formation, already function in the discourse of poetics: others have written about covers (Andrzej Sosnowski or, quite differently, Darek Foks) resampling, and the remix (let us take Adam Wiedemann as representative). The sequel is, of course, a term taken from the language of cinema, especially the Hollywood variety. Consider, to name a few examples, the endless adventures of Captain America (grown out from the subsoil of comics), successive episodes of Die Hard with Bruce Willis (the Polish title, Szklana Pułapka [The Glass Trap], is a classic example of the Polish sense of humor in translating titles), the desperate attempts to revive the one-trick pony that was The Matrix, and so on and so forth. Their box-office receipts show convincingly that predictability and repeatability are signature features of art made to fit the cut of the public’s jib. For sceptics of cinema, a film sequel appears to be nothing more than a warmed-over slice of last summer’s pizza. Mackiewicz’s title refers, however, not to the dubious axiology of the category of the sequel, but rather the structural mechanics of the sequel based on repetition through variation. Furthermore, it remodels and expands the boundaries of the concept, examining it in four mutually complementary domains. Firstly, “the sequel in its most basic form should be detected un Sendecki’s work at the foundations of language. The poem is revealed to be a tool of modernization. It is also a cognitive instrument” (S, 7). Secondly, the sequel is a figure of autorepetition. For the work of Sendecki, that means a critical reworking of “ideas, themes, authors, and poems that at some point influenced his earlier work in a particularly strong way” (S, 7). Thirdly, a sequel signifies a recontextualization of something from the past. In the case of the author of Błam, that means the avantgarde and neo-avantgarde traditions of the twentieth century. And in the end, fourthly, a sequel is never an exact repeat of what came before. It is tied to change and the resultant category of the game – in this sense, Sendecki enters into dialogue with works firmly grounded in the tradition of reading. The four chapters of Mackiewicz’s book correspond to the four semantic fields of the sequel. The opening chapter, “Nie ze słów (trzej panowie S.)” (Not from Words [The Three Mr. S.’s]) places Sendecki alongside the poetry of Piotr Sommer and Andrzej Sosnowski. In this triangle, not all sides are of equal length: Sosnowski is shown to be closer, and that is due to his relationship with language, which is treated “as a medium set in controlled motion, but never fully predictable” (S, 43). 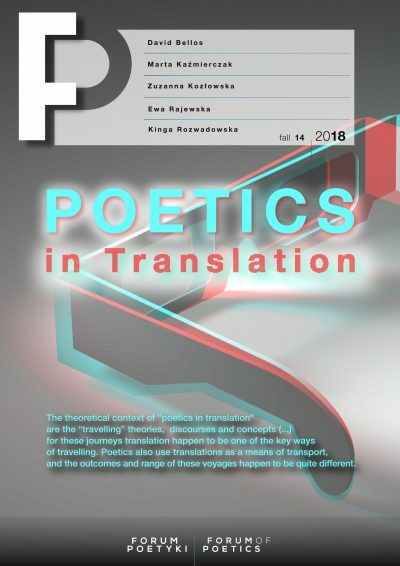 The second part, embarking on a conversation with poetic sources, attempts to situate Sendecki’s work in the context of the accomplishments of the New Wave poets (though these are considered not as a literary group but rather as presenting separate literary practices). After reading their work, the elements that emerge as vital are mistrust and a constructivist approach to poetry. That is probably the most straightforward and powerfully argued case for assigning these poems to the constructivist camp. The third chapter compares Sendecki with American poets (mainly James Schuyler). And the closing segment of these meditations on sequeltude is an analysis of intertextual connections with the late poetry of Jarosław Iwaszkiewicz and the works of Polish Romantics. In it, an attempt is made to “show the sequel as a form of seizing possession” (S, 148), and thus – to use the rhetoric of Harold Bloom’s revisionist tropes – putting on another’s voice to thereby make it one’s own. The final sentences also speak of the fact that such a device can function as a defense from the charge of hermeticism. What is the image of Sendecki, the author of 22, that emerges from this composition? Mackiewicz at a certain point uses the metaphor of a palimpsest city, worth quoting in entirety for its rare beauty: “Iwaszkiewicz Square at the centre, the riverbank quarter of the New Wave, the winding Marcińska Street (also called the Street of the Three Marcins), the Old Town with Słowacki Street and Mickiewicz Lane, the Frank O’Hara promenade frequently visited by out-of-towners, the Karpiński Villa, the bandshell on Sosnowski Green, the OuLiPo bowling alley, the of campus the James Schuyler Memorial Foreign Language School, Foks Point” (S, 81). This urban design is truly intricate. Some parts of it have been described, but to move freely from one nook to another demands a high level of mastery. Mackiewicz does it with great skill, often with enviable professorial loquaciousness on esoteric topics of contemporary Polish poetry, building rich literary contexts, which in the final reckoning serve one purpose – the patient reading of a poem. Drawing a map may be of value in itself, but in the case of poetry the categories used for cataloguing always have a certain amount of inherent arbitrariness. The final gauge is a question concerning the text, which for the author of Sequel means a question in equal measure concerned with the hermetically understood category of sense. Mackiewicz is most interesting, when he makes point-by-point analyses of even the most enigmatic poems (for example the highly elliptical work “[Ce]”; S, 136-138). The final chapter, in which the category of the sequel no longer occupies the foreground, goes against the grain of the overall tendency by closing the book rather than summing up, and is therefore the most intriguing part. The chapter is entitled “‘Aż zrobią się całkiem ciemne, juczne’. Wokół metafory Marcina Sendeckiego” (“They’re Going Completely Dark, the Beasts of Burden.” On Metaphor in Marcin Sendecki) and is devoted to a less relational reading, focusing rather on the poetic technique itself. Mackiewicz asks a very important question, namely whether “an uncompromising approach to semantic overload […], and constant breaking of contact with the reader always and everywhere works to the benefit of Sendecki’s poetry?” (S, 149). If each reading of a poem called for bottomless expert knowledge, that would lead to a communicative impasse. Mackiewicz asserts, however, that there is a more or less universal key, a common and historically non-contingent principle of composition. “This principle may be called reductive associativity. It is based on […] the combination (association) of at least two different, unrelated imaginative orders” (S, 149). And thus: in the poem “Niedziela” there is an encounter between painting and eroticism; in the poem “[Czerw]” – between fruit-farming and medicine; the piece entitled “[Kre]” creates a collision of the funereal and mercantile orders; in “[Trap],” ritualism enters the life of harbour workers. This other approach to Sendecki’s poetry, more immanent, drawing its categories directly from the poems, also holds promise for the possibility of a different way of reading. Mackiewicz uses his philological sensibility to build a poetological narrative not from a traditionally literary perspective, but rather from the perspective of readerly practice (for purposes of argument I am stipulating that the two can be separated). It is as if the ending were intended to say that nothing is certain yet, that what we have seen so far was little more than loosely trying things on, a mere instalment in a series of tales about the author of “[Trap].” For my part, I confess that I would be more than happy to read another book on Sendecki if it started out with the strategy adopted on the final pages of the book we have been discussing. I took as my conditional point of departure the problems that Sendecki’s poetry falls into in relation to the world. Mackiewicz cannot in the slightest be accused of ignoring them. Nonetheless, working with a fairly traditional understanding of the concept of the literary work’s “mimesis,” he does not bring us to a more complicated view of that category, nor (on the Hegelian model) to its demolition. Upon subjecting his explications of poems to scrutiny, we find ourselves faced at times with mutually conflicting difficulties. Analyzing the differences in how optic-solar metaphors are used in the first published version of the poem “Niedziela” (Sunday) and the anthologized version, Mackiewicz states: “the poem became more mimetic, though more terse and less detailed in its telling” (S, 112). In another place, he speculates on the effects of an intertextual connection therein with O’Hara and declares: “The linguistic effect of ‘Niedziela’ is of course illogical and non-mimetic: nobody imagines the organ [the heart – KH] lying before the owner as he regards it. Such an operation is only possible in language” (S, 150). As a result, his reading of the poem “Niedziela” is caught in the struggle between two forces set on the same axis: language / world. Perhaps an approach that problematized that opposition (fundamental as it may be to the art of late modernity) would make it easier to understand his interpretative decisions. The category of “mimesis” is thus a litmus-paper indicating a certain (tempting?) conservatism in the position presented by Mackiewicz. Simply put, in Sequel we find a very traditional view of the literary scholar’s profession and its duties. At the level of style (which I use synecdochically to represent the whole), this is evident in his manifest penchant for an archaicizing and register-raising conjunction (“atoli,” equivalent to “howbeit” or “withal”). The point here is not to dwell on such items, however, but rather to address the programmatic, sui generis old-fashionedness that they signal – which at the same time should not be understood as being behind the times, and which, in the portions devoted to textual analyses, manifests itself as a strong belief in classical literary scholarly tools, particularly the analysis of rhythmic structures. This belief can, at first, create the impression of near-obliviousness to changes in the study of literature over the last several decades, but in the end, it rather constitutes an articulate scholarly position, whose fundament is – potentially allied with Stanley Fish, who has complained about the eroding boundaries between disciplines – a perspicuous effort at a professionalized discourse. The author in fact takes an unequivocal stance with regard to knowledge when he states that anyone who fails to perceive the Barańczak hypotext of one Sendecki poem, “does not have […] and adequate grasp” of it (S, 79). Hiding under double cover (in a footnote and through a quotation) he comments: “‘I know I’m giving myself away like this as hopelessly behind methodologically, but if you’re born to be hanged…’” (S, 79, przyp. 110). It appears that Mackiewicz, though he never states it directly, considers the solution to the dethroning of literature’s function (and that of poetry’s within literature) to lie, not in placing the literary medium amid broader cultural processes (as, for example, Anna Kałuża does in her books on contemporary Polish poetry), but rather – on the contrary – strengthening its autonomy. Acting somewhat in defiance of that proposal, moving rather in the direction of methodological expansion, the temptation arises to ask how the titular metaphor might function in a broader context. Mackiewicz treats a sequel as an authorial, self-contained, poetological concept. Yet wit would seem that examining Sendecki’s poetry as a form of printing plate on which the state of the culture is exposed, could allow a chance for the sequel to play out as a multi-functional tool for describing contemporary art. 2015 also saw the appearance of Widmontologia (Spectrontology) by Andrzej Marzec, which indirectly proposes such a development. If the sequel in the popular understanding is primarily the continuation of a film, a re-creation of something well-known, its operation is based on supplementation of something bygone. “Contemporary […] culture can be called reality, part two,” Marzec argues, invoking the Derridean interpretation of the spectre. A culture that cannot separate from its own past must continually return to it, but not to invoke its full presence, only as a visitation impossible to complete, an after-image of its earlier manifestation. Marzec reads the craze for retro and vintage styles this way, but he also applies that interpretation to the category of the sequel. The anachronistic spectres or phantoms that pop up in contemporary culture appear “among other places, in quotations, reinterpretations […], phenomena such as: sampling, remix, ‘cut&paste’ techniques, ‘covers,’ mash-ups in music and found footage, remakes, and sequels in film.” The potential of the sequel as spectre seems all the more to cry out for deployment as Mackiewicz’s book opens with a fantastic quotation from Kazimierz Wyka (dating from 1946! ): “That which is renounced and bygone comes back,” which could be a quote from Derrida. Or is the reverse true? Perhaps in Derrida’s words from 1993, what matters is “[a] question of repetition: a spectre is always a revenant […] it begins by coming back,” we should hear an echo of Wyka from across five decades? Those words should not be read as a demand for a methodological perspective which does not fit the readerly sensitivity presented in this book on Sendecki. The question remains, nonetheless, whether it might not be more effective, if we are to approach the sequel spatially (not through distension of the term to the point where it becomes inoperative, but rather inscription within the frames of a larger discourse), to let the work of one of the most interesting and boldest contemporary Polish poets (as shown by Mackiewicz’s book), a voice with much to say on the contemporary state of culture, do so for us? The article offers a critical commentary on Paweł Mackiewicz’s Sequel. O poezji Marcina Sendeckiego (2015). 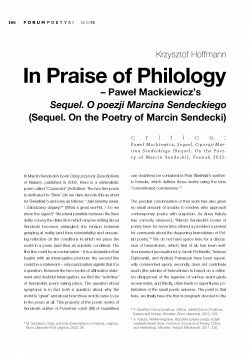 The author recognizes the pioneering role of the first monograph on Sendecki, in its effort to situate the poet within literary tradition (both the Polish and the world traditions), and simultaneously addresses certain limitations that result from the reading strategy Mackiewicz chooses to adopt. A “conservative” position vis-à-vis the scholarly tasks presented by Mackiewicz is underscored. The article poses the question of whether it is possible to expand the titular category of the sequel (for example in the context of the deconstructionist notion of l’hantologie) in such a way that it might become a tool for the description of cultural phenomena. M. Sendecki, Opisy przyrody (Descriptions of Nature), Legnica: Biuro Literackie Port Legnica, 2002, 26. P. Śliwiński, Horror poeticus. Szkice, notatki (Horror Poeticus. Essays and Notes), Wrocław: Biuro Literackie, 2012, 109. A. Kałuża, Wielkie wygrane. Wspólne sprawy poezji, krytyki i estetyki (Great Wins. Common Concerns of Poetry, Critics, and Aesthetics), Mikołów: Instytut Mikołowski, 2011, 126. P. Mackiewicz, Sequel. O poezji Marcina Sendeckiego, Poznań: Wydawnictwo WBPiCAK, 2015. Further citations from the book will refer to Mackiewicz, S, followed by the relevant page number. Compare with, for example: A. Świeściak, “Sendecki i awangarda” (Sendecki and the Avantgarde), in: Świat na językach (The World in Languages), ed. P. Śliwiński, Poznań: Wydawnictwo WBPiCAK, 2015, 63-74. Here are three quite randomly chosen examples from early in the book: “Howbeit Sendecki is not particularly interested in language as an abstract system, a kind of self-driving machinery” (S, 29); “Howbeit, one can judge that […] the replacement of the music from ‘Techno’ [by Sosnowski] with silence in ‘Tango’ [by Sendecki] overestimates the originality and the weight of the difference between the two poems” (S, 39-40); “Howbeit contrary to the oversimplifications and claims of the reception of a fundamental part of the New Yearlings’ work, it is not limited, obviously, to poetic promotion and civic-consolatory poetry” (S, 56). For example, in his analysis of the poem “[Proszę]” ([Please]), it is shown to be important that “it is an exact hypercatalectic iambic tetrapody, with a few initial substitute feet, natural to the flow of iambs in Polish language” (S, 68). It should be noted that analyses of this type are not merely showing off phonological expertise and do find their reflections in his interpretations of texts. Furthermore, some of them are daunting in their level of detail – discussing Iwaszkiewicz’s poem “Ostatnia piosenka wędrownego czeladnika” (Last Song of a Wandering Journeyman) Mackiewicz writes: “The whole poem draws attention to itself by the length of its lines – they span from 15 to 17 syllables. […] The first stanza, a quatrain with regular ABAB rhyme pattern, partially grammatical in its clausulae, is formed, without exception, from sixteen-syllable lines, with regular caesurae after the eighth syllable. […] In the first stanza, two kinds of feet appear – not counting the substitutional trochee at the beginning of the post-caesura (clausula) part in the third line mentioned above, these are iambs and anapests. We can thus speak of logaedic rhythm (iamb + anapest), typical for Polish poetry. If this logaedic rhythm is not entirely typical, that is only because in logaedic verse, formed from precisely such feet, iambs are most frequently divided from anapests by the caesura.” This is only a sample of a longer argument concerning the first stanza. The full rhythmic analysis takes up more than two pages (S, 140-142). A. Marzec, Widmontologie. Teoria filozoficzna i praktyka artystyczna ponowoczesności (Spectrontology. Philosophical Theory and Postmodern Artistic Practice), Warszawa: Fundacja Bęc Zmiana, 2015, 251. Quoted in: S, 5 (K. Wyka, “Ogrody lunatyczne i ogrody pasterskie” (Sleepwalking Gardens and Shepherd Gardens), in: Wśród poetów (Among the Poets), selected by K. Wyka, with an introduction by M. Stala, Kraków: Wydawnictwo Literackie, 2000, 16). J. Derrida, Specters of Marx: The State of the Debt, the Work of Mourning and the New International, trans. Peggy Kamuf, New York: Routledge, 2012, 11.